The World of Peachtree Publishers: Claude at the Circus! Claude is back and at it again! This time, when Mr. and Mrs. Shinyshoes leave for the day, Claude's adventures with best friend Sir Bobblysock take him to the park. Their outing takes an unexpected turn when they save a baby from a runaway buggy and eventually find themselves performing in the circus! Check out these stops on the Claude at the Circus blog tour and keep up with all the crazy fun! 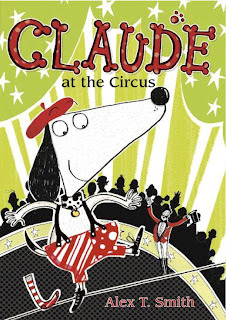 You can also keep up Claude's shenanigans on Twitter with #claudecircus and follow author @Alex_T_Smith!